Every year at Christmas time, folks have questions about the “poor widow’s mites” made famous by the story in Mark 12:41-44 and Luke 21:1-4. It is not surprising that scholars who did early English translations of the Bible had a tendency to “reinterpret the ancient coin denominations of the Greek, Latin, and Hebrew scriptural sources in terms of contemporary sixteenth- and seventeenth-century English money,” according to Oliver Hoover, who discussed this in detail in the ANS Magazine, 2006, 2, and points out that neither the original Greek text of the New Testament nor the Latin Vulgate Bible, mention the “mite.” Instead the Greek or Latin words used in that version are either lepta or minuta respectively. The word “mite” was most widely disbursed by the King James Version, printed in 1611, after work by 47 scholars that lasted nearly seven years. “Not only would this translation become one of the most popular English versions of the Bible ever published, but the artistry of its language ensured that it would also become one of the greatest single influences on the development of English literature well into the twentieth century,” Hoover said. The translators wished their work to “speak like itself, as in the language of Canaan, that it may be understood even of the very vulgar.” For this reason, the King James Bible and some earlier English translations are of “some interest to numismatists, given their tendency to reinterpret the ancient coin denominations of the Greek, Latin, and Hebrew scriptural sources in terms of contemporary sixteenth and seventeenth-century English money. Thus, in a small way, the King James Version serves as a document for the circulating coinage of early modern Great Britain,” Hoover wrote. However, there was no mite coin known to exist in British coinage of this period. “In fact, the mite (meaning “small cut piece” in Old Dutch) was only created as a circulating coin of Flanders in the fourteenth century. Initially, the mite was a small billon [very low quality silver] coin...but by the sixteenth century it had become copper,” he explained. One might guess, therefore, that this denomination was imported and used in Britain at the time, but “there is little evidence to support this possibility,” Hoover wrote. Even though the Dutch mite did not circulate in Britain, and no British mites existed, the mite was mentioned in sixteenth-century arithmetic books as a fraction of a farthing, varying from one-third to one-sixteenth. Later, during the seventeenth century British money had not been decimalized and was organized according the pound/shilling/pence system. There were 240 pence (pennies) to the pound. There were smaller denominations than the penny, such as the farthing, which was one-quarter of a penny. There was an even smaller coin, worth a half-farthing, and it was called a mite. Hence, the smallest coin in circulation in early first century Jerusalem, became known worldwide and probably for all time as the mite. It is logical that people who are interested in the stories of the Bible would want to know more about these coins and exactly which ones could be associated with the stories. Whatever its origin, the poor widow’s mite has become one of the most frequently referenced and most popular ancient biblical coins. -- It is certainly a story about charity and goodwill, rather than a story about money. The poor woman gave all she had to the treasury of the Jewish Temple in Jerusalem, while, relatively speaking, many rich people gave little of themselves. -- The amount of money the widow threw into the Temple treasury was two coins of the smallest size in existence in Jerusalem at that time. There is no doubt that the small prutah (Guide to Biblical Coins (GBC) Nos. 1152, 1153) or half-prutah (GBC Nos. 1134, 1138, 1147, 1185-87), coins of the Maccabean kings and Herod the Great, fit that description. The most common among them, easily by a factor of more than 1000 to 1, is the small prutah that was most likely struck by the Hasmonean successors of King Alexander Jannaeus (103 – 76 BC), which have been documented to range in weight from 0.20 to 1.70 grams, with an average of 0.81 grams. The massive issue of these tiny bronze coins in this poor land filled a market need. Some versions of these coins may have been first struck very late in Jannaeus’ reign and likely continued to be minted periodically until as last as 50-45 BC. These coins were all decorated on one side with an anchor and on the other side a crude star. Herod I (40 – 37 BC) also minted very similar looking coins but much more scarce coins, possibly quite early in his reign, which technically began on the ground in Judea around 37 BC, these coins range in weight from 0.49 grams to 1.78 grams with an average of 0.94 grams. Herod’s coins are decorated on one side with an anchor and on the other side a crude inscription. The similarities of the Herodian to the Hasmonean in both design and method and general appearance coins suggest that the latter were crudely copied from the earlier ones, and archaeological finds suggest that their circulation overlapped. Both the Hasmoneans and Herod I also issued relatively small numbers of a few coin types which were clearly meant to be half denomination prutot. The best current evidence suggests that during the first century, the Judean shekel was made up of 256 prutot. Consider that there are 100 cents to the dollar; hence this was very small change indeed. In those days one pomegranate cost only a prutah and in those days many pomegranates grew wild and could be plucked off trees in many areas (as they can today in Israel) for free. Archaeological evidence proves that even though these small coins were struck in the first century BC, they continued to circulate well into the first century AD when Jesus lived, and even for as long as the fourth century AD. This has been shown by archaeological excavations in Israel. At the Joint Sepphoris excavation in 1985, we found the small prutot of Jannaeus in the same areas as fourth-century Roman bronze coins. These were useful pieces of small change, at a time and place that small change was not easy to find (many late Roman and Byzantine small bronze coins were chopped in halves and quarters to accommodate the market need). Another aspect of the story of the poor widow’s mite remains relevant today: Many people of great means contribute little to charitable causes, while less wealthy individuals contribute a great deal relative to their ability. This is a topic fit for everyone to ponder. Watching the world change as time passes is an interesting process, and I am especially sensitive about it whenever I write an obituary about one of my longtime friends and colleagues. All kinds of stories from the old days are brought to the top of the memory heap. Most recently I wrote a tribute and obituary about Shraga Qedar, my friend of 40 years for CoinsWeekly (http://www.coinsweekly.com/en/News/4?&id=3695&utm_source=newsletter&utm_medium=email&utm_campaign=CoinsWeekly+15.10.2015). I have previously written obituaries for two other friends and mentors, Prof. Ya’akov Meshorer and Prof. Dan Barag, legendary teachers, authors, archaeologists, and numismatists. Back in 1993 I wrote about two other friends from Jerusalem who died within a few months of each other. They were especially interesting because of the key roles they played in the Dead Sea Scrolls drama; they brought the scrolls to light in the first place. In 1946, a 13-year-old boy of the Ta’amira Bedouin tribe was hiking with older friends in the cliffs on the western shore of the Dead Sea. Some say they were shepherds minding goats. Others observe that the Ta’amira Bedouins have dealt in antiquities for 150 years and they simply may have been combing those historically rich hills for artifacts to sell. The boys took his advice. 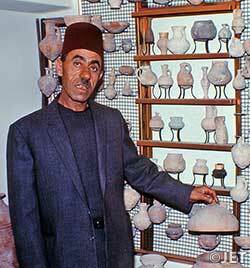 A shoemaker in Bethlehem named Kando also displayed oil lamps and small antiquities in his window. Kando recognized potential in the scroll fragments and bought them, although at that time the oldest known written manuscripts dated back only a few hundred years. Eventually, Kando sold some of the scrolls to Samuel, the Syrian Metropolitan at the Monastery of St. Mark in Old Jerusalem. Samuel later advertised his scrolls in the Wall Street Journal. When the 13-year old Bedouin boy who helped find the Dead Sea Scrolls grew up, he adopted a new name, in the Arab custom, after his first son was born. 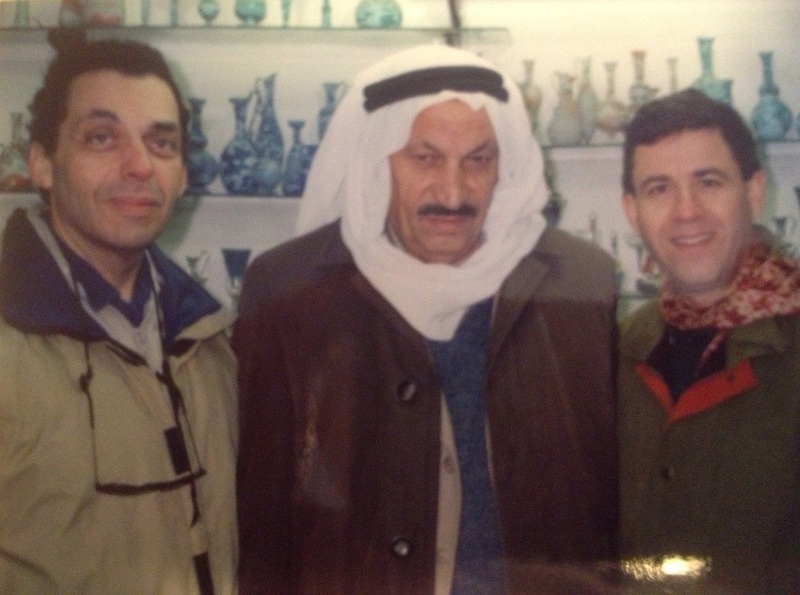 Abu Ali al Taweel was well known by Israeli antiquities enthusiasts. General Moshe Dayan wrote that he often bought antiquities from Abu Ali, who also once saved the famous general’s life. “I do not think anyone has ever succeeded in duping Abu Ali by trying to sell him a fake antique or a counterfeit coin. Whenever I bought anything from him, I could always be sure that it was authentic. “One day I received a message from him telling me that he had a beautiful earthenware censer that he was sure would interest me. We arranged to meet in Jerusalem and there I saw it.... I bought it and asked where it had been discovered. Abu Ali said it was found in a cave south of Bethlehem. I asked him to take me there. I wished to see what kind of cave it was, whether a burial cave, a dwelling, or one used for pagan rites. “He promised to do so and we fixed a date. But shortly before we were due to meet, he informed me that he was very busy and asked for a postponement. He postponed the next meeting too on some pretext or other. I refrained from interrogating too closely one so much smarter than I, and I just went on waiting. The hoped-for day finally arrived and we set out for the cave. Abu Ali died in Bethlehem in 1993 at age 60. He had been ill with cancer for some time. 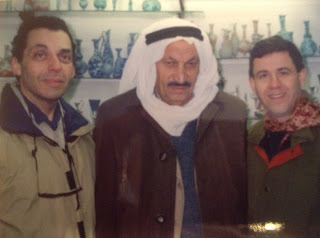 I had often met with Abu Ali over the previous 20 years. For a while he owned a little nut and sweet shop near Manger Square in Bethlehem. Over six-feet tall, with a strong, handsome face always framed by a white kafeyah, the traditional Bedouin headdress, Abu Ali cut a colorful figure. When I visited Abu Ali, he sometimes showed me coins or antiquities. Over the years, via friends as interpreters, he told me many stories, including the one of how he and his friends found and sold the Dead Sea Scrolls to Kando. It was only about three weeks before Abu Ali died that Khalil Iskander Kando, age 83, also of Bethlehem, died. Kando had been an officially licensed antiquities dealer for decades and operated a small shop in East Jerusalem, in a room above his gift shop, adjoining the St. George Hotel in East Jerusalem. Kando, called Abu Anton, wore a burgundy fez and traditional white robes each time I saw him. 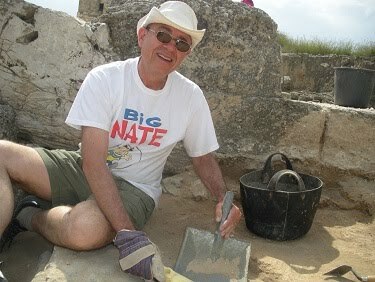 A tall man with larger-than-life features, he took delight in showing me interesting coins and ancient artifacts. Kando never wanted to talk about the scrolls. Yet in a nook off the stairway to his tiny, second-floor antiquity shop stood one of the very jars in which they were found. No matter how often I asked, he would never pose next to it for a photograph. 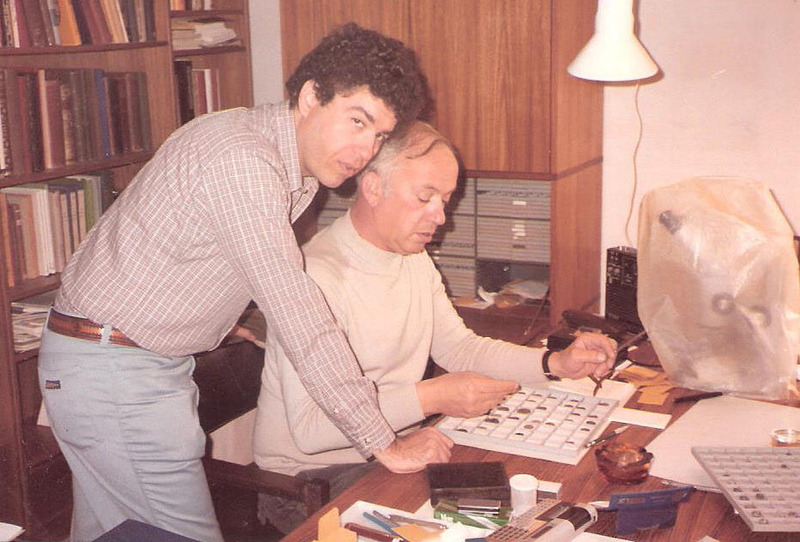 Once in the 1970s, I sat across from Abu Anton, looking at ancient coins. He was cleaning one in a jar of dilute sulfuric acid he kept on his desk for that purpose. As we talked, he took a dental bridge out of his mouth and dipped it into the acid. Next he brushed it with the toothbrush he had been using to clean coins. Kando shook off the dental work and returned it to his mouth, resumed talking and never even puckered. Abu Ali, the finder of the Dead Sea Scrolls, and Abu Anton, their first buyer, were both publicity-shy. Both were tarnished during the 1950s when, reportedly, some scrolls were deliberately cut up and sold in pieces to extract higher prices from the market. And stories linger that some pieces of scrolls may still remain in private hands in Bethlehem today. Persian Silver of Judah--And a Movie on Utube! The earliest coins with Hebrew inscriptions were struck during the Persian period. It seems likely that the earliest of those coins were struck at the early Philistian mint of Gaza. Later, only small denominations were struck in Judah, quite likely in or very near to Jerusalem. These are known as “Yehud” coins because most of them are inscribed with the paleo-Hebrew legend YHD, although some carry the name Hezekiah and one very rare variety has the name of a priest named Yochanan. It was quite a technical feat for coins to be minted at all in this area, which was rather out of the way at the time, and did not have great technological capabilities. The mints in ancient Judah probably quite resembled small blacksmith or jewelry shops, which have must have been in the precinct of a fort or a palace because of security matters in the transport of uncoined silver and then actual coins. These first coins struck in Judah were patterned after Athenian coins and were struck some time before 333 BCE. The denominations of the coins are uncertain. However this group seems to be related to the known weight of the Judean shekel of 11.4 grams beginning in the Iron Age about 800 BCE. The two denominations of the earliest small silver coins struck in Judah weigh around either half a gram or a quarter of a gram. These weights correspond with approximately 1/24 of the known weight of the shekel. Archaeologists believe that there were 24 gerahs in each shekel at the time, although in Exodus 30:13 we read “the shekel is twenty gerahs.” This discrepancy may be due to a slightly different division of the shekel in an earlier period. Half a gram is very light and small for a coin. Manufacture of such tiny objects caused some challenges, because the dies that were created to strike these coins were very fragile due to their small size. Because of this, the dies were subject to either heavy wear, or absolute breakage. Numismatists today can track that process rather precisely if they can identify a sufficient number of specimens. The most common of the early Yehud coins is a type with an obverse portrait of Athena and the reverse portrait of an owl, just like the classic Athenian tetradrachm. But instead of the AΘE ethnic inscription for Athens, the coin carries the paleo-Hebrew script YHD. It is estimated that this type represents a full 15% of the Yehud coins in existence. Canadian numismatist JP Fontanille, also a professional musician, has gathered some 225 photos of this coin type in various die stages, and has created a fabulous brief video accompanied by music he composed and plays. Viewing tip: Keep your eyes on the coins!